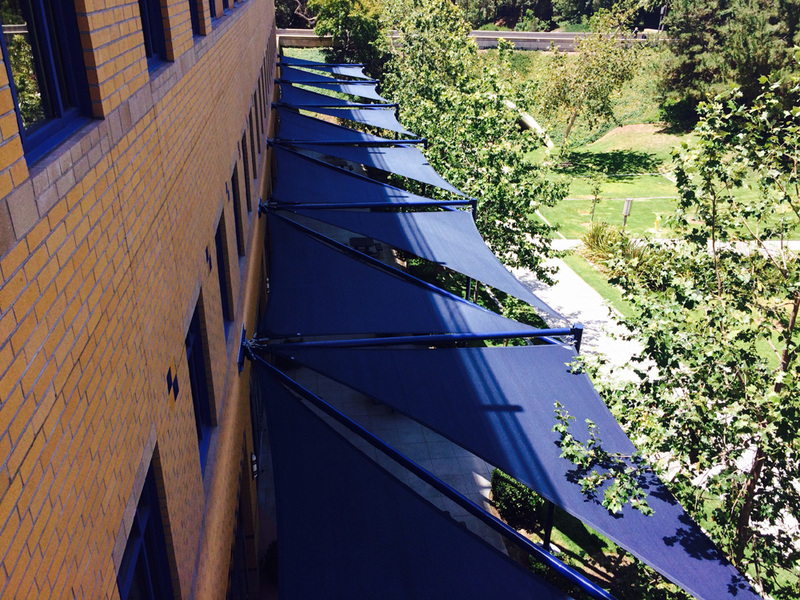 Tensioned fabric architecture offers an immense amount of design flexibility – which translates into exciting opportunities for creating iconic structures and the need for a deep understanding of the building materials’ capabilities. From the fabrics and frames to the membrane attachments and everything in between, your project requirements and criteria should guide the material selection process – especially when it comes to the membrane. 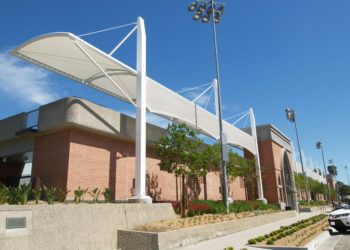 Choosing the membrane for your tensioned fabric structure shouldn’t simply be about cost. It should be about aligning project goals with the material’s performance. 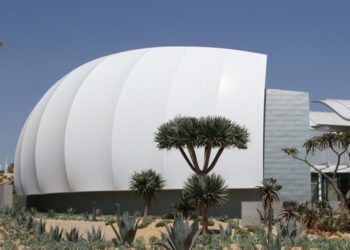 After all, the membrane contributes to the structural integrity of the project; plays an integral role in functional aspects such as light transmission and durability; and defines (much of) the project’s aesthetic because it’s the most visible element. Here are some of the properties you should consider when choosing the best-suited membrane for your project. Strength – Different types of membranes can have significantly different levels of strength (aka the ability to withstand outside forces without rupturing or tearing). Teflon™-Coated PTFE Fiberglass Membrane is widely celebrated for its strength, but it’s not the only option. 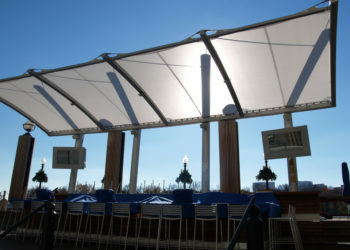 High-Strength PVC Membranes may be able to address your needs at a lower cost. Elasticity – Similar to strength but not the same, elasticity refers to the membrane’s ability to withstand stretching (aka tensioning) without tearing. The combination of strength and elasticity plays a major role in the distance a membrane can span without additional support (such as ridge cables). 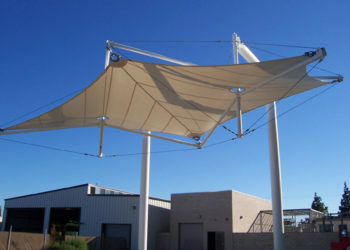 Durability – Playing a major role in a tensioned fabric structure’s lifespan, the membrane’s durability refers to its ability to resist UV degradation, decomposing organic matter, wind and rain, and other environmental factors. PTFE membranes are known for their durability, but TiO2 Coated PTFE Membranes take it to the next level with their “self-cleaning” capabilities. Light Transmission – Also known as translucency, a membrane’s light transmission refers to its capacity for absorbing and reflecting natural light. This will ultimately affect the aesthetic and energy behavior inside (or underneath) the structure. Light transmission becomes especially important when designing Tensile Facades. 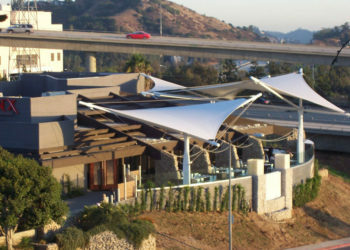 Fire Resistance – Membranes used in public spaces often need to adhere to certain fire safety codes, including those used in tensioned fabric structures. The membrane’s fire resistance (aka its ability to withstand heat and flame without catching fire) is an essential consideration when choosing a material that’s best-suited for your project’s requirements.